Rain and snow fall, then soak into the ground, flow to the nearest stream, or evaporate into the air as part of the water cycle. Water that doesn’t evaporate moves down into larger and larger bodies of water. Upper Mississippi River Basin streams flow to the Gulf of Mexico, which adjoins the North Atlantic Ocean and the Caribbean Sea. Think about your local creek or river. Where does it start? What kind of land does it flow through? Where does it end up? That whole area is a watershed, also called a drainage or basin. 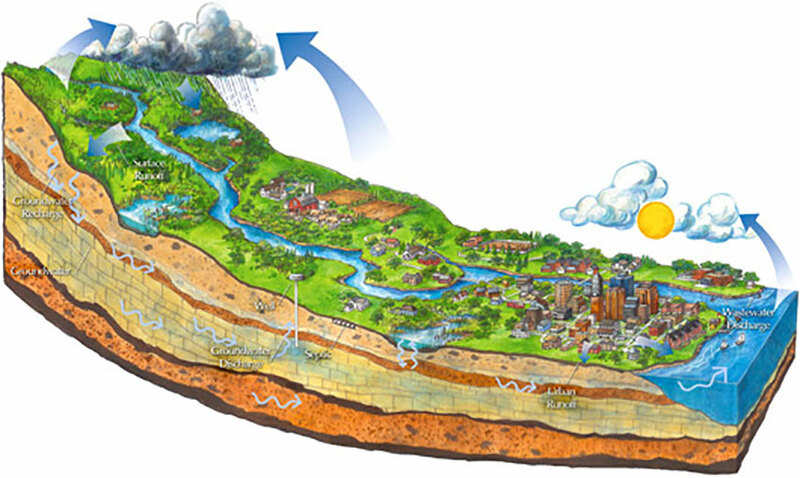 As water moves, it forms a network of rivers and streams that begin small and grow progressively larger. The Mississippi River watershed covers 1.2 million square miles or about 40% of the lower United States. Its borders are jagged because they follow land forms, unlike the straight lines of city, county, and state boundaries. This overlap of political and watershed boundaries makes watershed management challenging. Whatever their size, watersheds move our most precious resource. They supply water for drinking, recreation, agriculture and industry, and give life to us and countless species of animals, insects, fish, and plants.